I have waited until after the election to make significant political commentary. I find the engagement with American politics more detrimental than helpful, much of which is based on the surplus of rhetoric in place of reality-driven conversation. 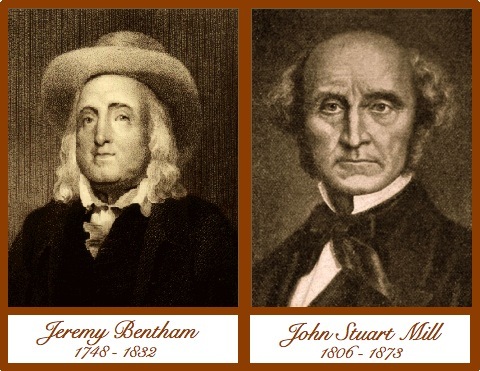 Philosophers Jeremy Bentham and John Stuart Mill best represent utilitarianism, specifically in relationship to contemporary American politics. While both utilitarians aim for the highest good being given to the greatest number in possibility, there is a significant distinction between Bentham and Mill. Bentham’s approach was to get happiness to the greatest number, no matter the degree. Thus, he preferred the quantitative approach to utilitarianism. Mill, a contemporary of Bentham, stated that the quality of happiness is of greater concern than the quantity which is produced. While endless commentaries can be written on Bentham and Mill’s utilitarianism, the basic introduction above is sufficient enough for this discussion. The current political paradigm in America represents both these men. The Democrats embody Bentham’s approach whereas the Republicans carry out the methodology of Mill. Note, however, that both parties, in relation to the political-ethical issues, are utilitarian. It is the method of gaining happiness for people that is distinct. Narrowing down the discussion to one specific political-ethical topic, let the current healthcare debate in America be utilized as an example. The Democratic party (in general) is the supporter of government-controlled healthcare. They believe the current healthcare system is flawed and in order for people to receive healthcare in an efficient manner, it must be regulated and distributed evenly for all people. Note the Benthamian emphasis. The Democrats want to spread healthcare to the greatest number of people. Even if not admitted publicly, the quality of healthcare is likely to diminish to a certain degree. Yet, the goal of happiness in relationship to healthcare, according to Democrats, it to provide healthcare to the greatest number of people – thus, placing quantity over quality. The Republicans, on the other hand, generally oppose the healthcare initiative as it currently stands. I have seen the argument made that putting healthcare in the hands of the government would reduce the quality of healthcare because it is mandated for so many people. Thus, Republicans desire healthcare to be in the hands of the private sector and thus be granted to those who can afford such practices. Thus, an emphasis on quality over quantity. The purpose of writing this short piece is to emphasize the similarity of the American political parties. Both, in the case of healthcare, operate under a utilitarian theory of the political-ethical arena. The distinction, in practice, seems to loom large and displace productive dialog with incessant bickering. Yet, in theory, this understanding of the political-ethical world is much more related than what the public typically sees portrayed. It is my hope that Democrats and Republicans take notice of the minor distinctions under a generally similar theory. This, in furthered hope, can reestablish positive discussion between the two parties to better understand the needs of the American people (and the citizens of the world). I don’t fully agree. While I think you’ve got the Democratic ethic pegged, the Republican ethic (or at least the liberal vs. conservative ethics) seems more deontological to me. On the conservative view of the Affordable Care Act, for example, the argument is typically not simply that the quality of care would be diminished, but rather that it is not the function of government to provide such services, *therefore* any attempt to do so would be sub-par. The primary concern is one of duty/responsibility (to provide services versus limiting destruction). Quality of outcome is secondary. This is why conservatives will say that liberals “have no morals” – they don’t focus on duties, merely happiness quotients. And this is also why liberals will say that conservatives “don’t care about people” – they aren’t concerned with individuals (although, neither are utilitarians) as much as principles. And both sides rob virtue language blind, particularly in televised speeches. I understand how and why you would place conservatives in a deontological category. I think the case can be made for that. However, following trend, one can easily respond by stipulating that liberals can also operate under that theory. That is, it is the duty of the government to provide healthcare (one could argue). The essence of this post is to show how the two parties, in theory, are quite similar. It is the minor distinctions that become prevalent in media.